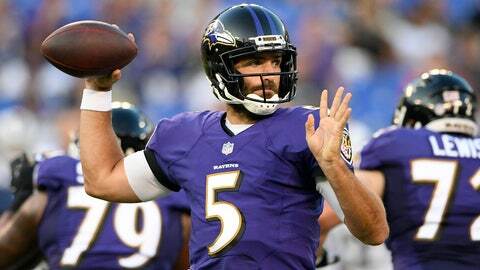 BALTIMORE (AP) — Joe Flacco needed only one series to show why there won’t be any competition this summer to determine the Baltimore Ravens starting quarterback. The other two guys, however, also put on quite a show. Flacco threw a touchdown pass on his only series of the game, rookie Lamar Jackson ran for a score and Baltimore rolled to a 33-7 preseason victory over the Los Angeles Rams on Thursday night. Baltimore (2-0) led 17-0 after the first period and cruised to the finish against the Rams (0-1), who rested offensive stars Jared Goff and Todd Gurley. Jackson went 7 for 18 for 119 yards, ran for 21 yards and was sacked twice before giving way to Griffin early in the third quarter. Griffin went 5 for 7 for 88 yards, including a 32-yard touchdown strike to Breshad Perriman. Flacco has been named Baltimore’s starter in the regular season. Griffin is seeking a comeback after being inactive in 2017, and Jackson is trying to adjust to the pro game after winning a Heisman Trophy at Louisville and being drafted in the first round last April. Jackson could learn a thing or two by watching Flacco. “He was awesome. He was smooth, had a lot of poise in the pocket,” the rookie said. The Ravens and Rams held joint practices Monday and Tuesday, and Los Angeles coach Sean McVay indicated the work against outside opposition would enable him to rest a few of his starters in the preseason opener. So, Sean Mannion opened at quarterback, Malcolm Brown lined up behind him and the offense sputtered for much of the night. Los Angeles gained 5 yards and made one first down in the first quarter. The Rams trailed 23-0 at halftime after totaling 45 yards and three first downs. Mannion played the first half, going 3 for 13 for 16 yards and an interception. “It certainly wasn’t my best performance. Just wasn’t really able to get into a rhythm early,” Mannion said. Both teams stood during the national anthem. While most of the Ravens lined up shoulder to shoulder on the sideline, second-year linebacker Tim Williams stood alone in front of the bench with his back toward the field. It appeared as if both teams got out of the game without any significant injuries. The Rams received successive 15-yard penalties in the first quarter for lowering the head to initiate contact, a new rule this season. Marqui Christian received the first flag, and Blake Countess followed. The penalties attributed for nearly half the yardage in a drive that produced a field goal for a 17-0 lead. Rams: After an extended stay on the East Coast, Los Angeles heads home to begin preparation for its next opponent, the Oakland Raiders at home on Aug. 18. Ravens: Their next preseason game isn’t until Aug. 20 at Indianapolis, but that begins a stretch of three games in 11 days.